The aim of this paper is to determine whether the present generation should preserve non-human living things (plants, animals and other organisms) for future generations, even if (i) in the future all the contributions these organisms currently make to human survival in decent conditions were performed by adequate technology and (ii) future people's preferences were satisfied by this state of affairs. The paper argues it would be wrong to leave a world without non-human living plants, animals and other organisms to future generations, because such a world would fail to secure one of the conditions of future people’s autonomy, that is, availability of adequate options. 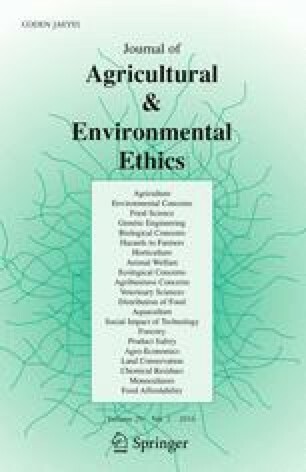 Building upon Joseph Raz’s account of autonomy, the paper shows that the presence of non-human living organisms is part of an adequate range of options insofar as, to be adequate, options must meet a test of variety. According to Raz, options pass this test if they enable human agents to exercise a set of physical, affective, imaginative and cognitive capacities humans normally have an innate drive to exercise. The paper discusses empirical findings as well as psychological theories that provide support to the hypothesis that interactions with non-human living organisms enable human beings to develop and exercise these capacities by shaping these capacities in a special way, different from the way interactions with other environments do. Versions of this paper have been presented at the Eighth European Congress of Analytical Philosophy (Bucharest), at the Philosophy, Law and Environmental Crisis Conference (Lausanne), at the Louvain-Aarhus Workshop on the Limits of Justice (Aarhus) and at the CELPA Seminar (Warwick). I thank all the participants for their comments. My special thanks to Axel Gosseries for his support and his insightful suggestions. I am grateful to David Axelsen, Jens Thaysen and an anonymous reviewer for very helpful comments on earlier drafts. All the remaining errors are my own. The work reported on in this publication has been made possible thanks to a postdoctoral grant from the Swiss National Science Foundation, another from the Centre de Recherche en Ethique (Montreal), and has benefited from participation in the research networking programme Rights to a Green Future, which is financed by the European Science Foundation. Meyer, L. (2008). Intergenerational justice. In E. N. Zalta (Ed. ), The stanford encyclopedia of philosophy. http://plato.stanford.edu/archives/sum2003/entries/justice-intergenerational. UN Foundation (2005). The millennium ecosystem assessment. http://www.unep.org/maweb/en/index.aspx.